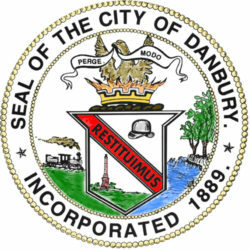 Howard Kaylan and Mark Volman, better known as The Turtles featuring Flo & Eddie, brought the latest version of their highly successful classic pop/rock tour to Ives Concert Park in Danbury for an evening of music from the ‘60’s, ‘70’s and beyond, performed by some of the era’s most iconic acts. The show took place on Friday night, August 4, 2017 at 8pm. Kaylan and Volman have described themselves as two slightly bewildered kids thrust into the fast lane of rock ‘n’ roll stardom, recording hits, achieving fame, hanging out with the Beatles, joining the Mothers of Invention and acting in the 200 Motels movie. They remain one of most enduring bands from the “Flower Power” period. 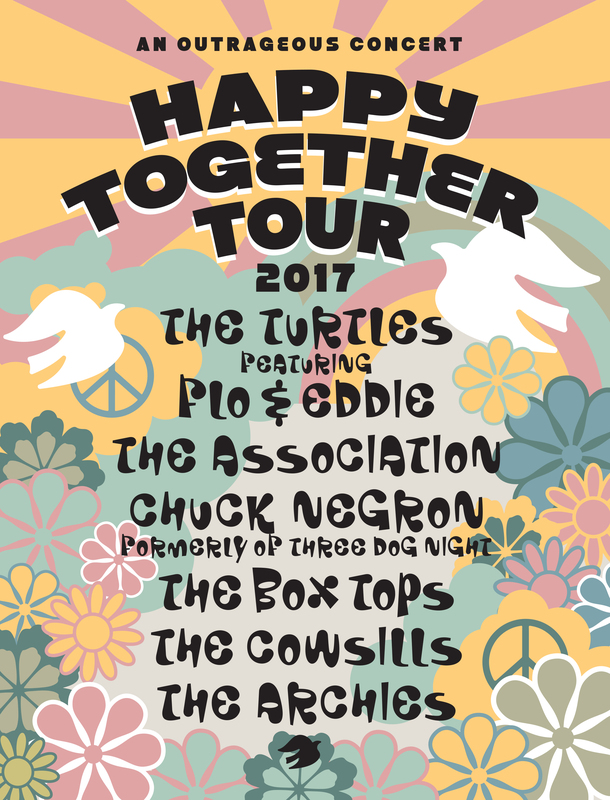 The 2017 version of The Happy Together Tour featured a cavalcade of Top 40 hits by The Turtles (“Happy Together,” “Elenore”) Chuck Negron of Three Dog Night (“One Is The Loneliest Number,” “Eli’s Coming,”) The Association (“Never My Love,” “Windy,”) The Cowsills (“The Rain, The Park and Other Things,” “Hair,”) The Box Tops (“The Letter,” “Cry Like A Baby,”) and Ron Dante of the Archies (“Sugar, Sugar,” “Bang-Shang-A-Lang”). 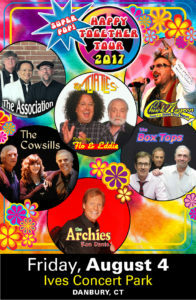 The Happy Together Tour has been attracting large crowds of happy fans since 2010.